Click here to go to interactive infographic. The infographic above came out in The Guardian, and is an exploration of the role played by private companies, nation-states and state-run companies in the generation of greenhouse gas emissions and climate change. There are 90 companies listed – all but seven are companies that deal mainly in fossil fuels. which illustrates the ‘remaining budget’ of carbon emissions left for humanity to generate if the goal is to limit a global temperature increase to 2 C°. 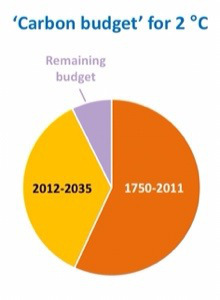 Mr. Boelen was irritated by the simplicity of the chart, which had the largest slice allocated to 1750 – 2011. The pie chart implies, to me at least, that we – meaning the current generations – aren’t necessarily responsible for the cumulative effect of carbon emissions because, after all, this is a process that has been going on since the beginning of the Industrial Revolution. Why should we take all the blame and by extension, have to make drastic changes? Mr. Boelen thought the pie chart needed a bit of refinement, and lo, the distribution of culpability looks a bit different when we find out that the vast majority of ‘carbon budget’ has been ‘spent’ (or perhaps more accurately, ‘squandered with profligacy’) since 1970. Almost all the major fossil fuel companies in the top infographic, at least in their original forms, were founded in the glory years of oil and gas discovery between 1870 and 1920, although the past 30 years have seen countless mergers. The companies have grown ever larger. As for nation-states, China accounts for 8.5% of emissions, with a continued rise due to its dependence on coal. Together, according to the soberly-titled report published in the journal Climate Change, Tracing anthropogenic carbon dioxide and methane emissions to fossil fuel and cement producers, 1854–2010, these companies account for two-thirds of all greenhouse gas emissions since the dawn of the industrial era. Half of all emissions have occurred in the past 25 years alone. So when we hear about how hard it will be to curb emissions, or that ‘this is the way things are done’ and how expensive it will be to change course, keep in mind that there is no long history or tradition behind our current carbon spending spree. This is as new as cars that are still driving on the road today. Very nice graph PK! There are so many informative ways of showing how much carbon was mined / sold / used by so few, all now alive. This message needs to be planted in the minds of people now in charge. The message that it is going to hurt to fix this needs to be communicated!